Everyone should be able to see time spent on the websites they visit and the applications they use. RescueTime Premium subscribers by default should ALSO see more-in-depth details about the individual web pages and documents they are using (although this can be turned off if desired). Are you subscribed to RescueTime Premium? You can figure this out by going to your billing page and looking at your account status. If you do not see activity details, check that you have enabled them in your settings. On any report page, drill down to activity details by clicking on the name of the activity. 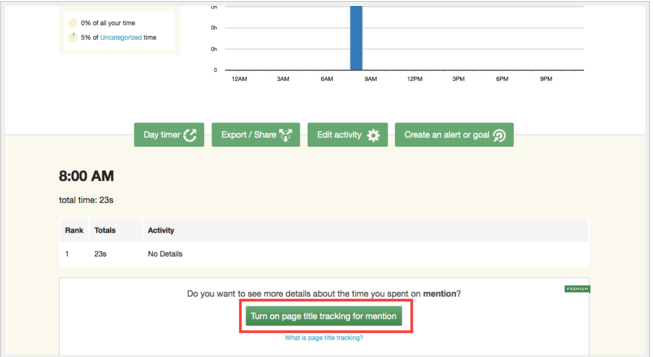 If you do not have details recorded, you will see a green button at the bottom of the page labeled Turn on page title tracking for mention. Clicking on this button will enable detail tracking. From the Categorize Activities click Detail Logging Rules. This page will give you a list of activities that are not currently reporting details. Click on the Enable Details button to activate the detail logging. Are your privacy settings correct? Go to your Privacy Settings page and make sure both boxes in the Logging Details section are checked. On OS X RescueTime needs an accessibility permission to gather window title information. 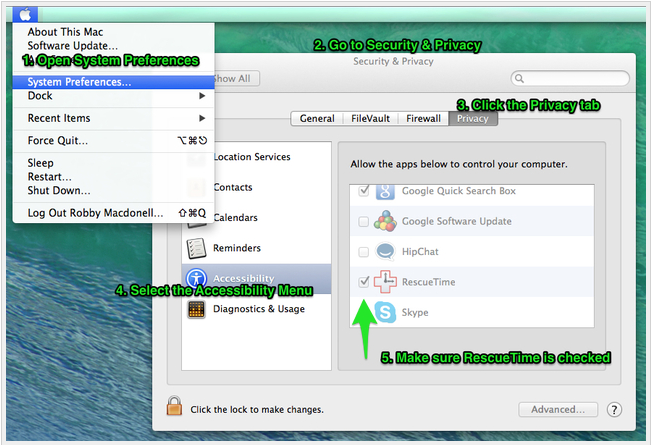 Follow the steps in this screenshot to ensure everything is set up correctly. If you are still having problems, please open a support request. We will be more than happy to help.